While it is well known that essential oils have many benefits, knowing the best brand to buy is not so easy. There are so many different companies selling essential oils and Plant Guru is just one of them. They are one of the latest companies to enter the essential oil market. And what I really like about them, is they offer a great selection of high quality oils at fair prices. 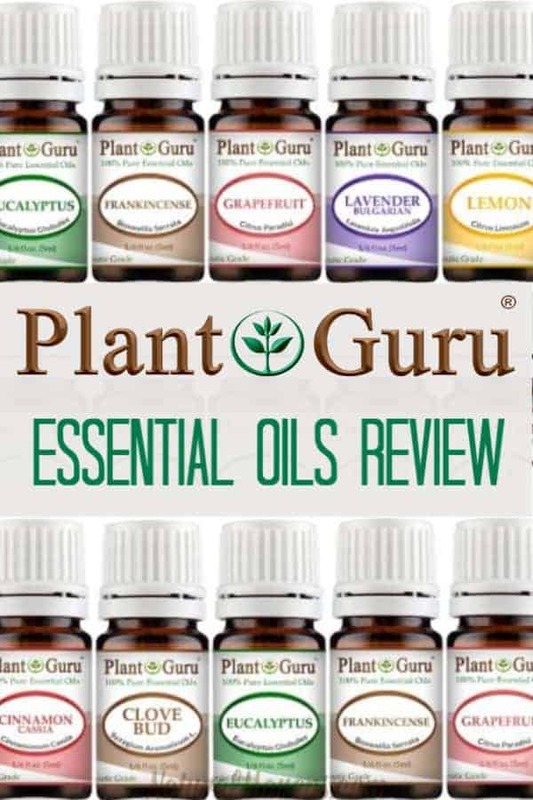 Below is our review of Plant Guru essential oils.Â We take a close look at the company, products and whether or not they are worth trying. Where Do Plant Guru Oils Come From? What Are the Drawbacks to Plant Guru? Should You Try Plant Guru Essential Oils? Plant Guru is a small company based out of Plainfield, New Jersey. They are a young, family-owned business with a passion for pure essential oils. What they don’t like is the high prices charged by multi-level marketing (MLM) companies that dominate the essential oil market. Traditional MLM companies need to charge high prices to ensure everyone in the chain gets a cut. The only person that gets hurt in this process is the average consumer like you and me. Plant Guru is a new business established in the summer of 2016. The young company does not have any physical brick and mortar stores or licensing deals with retailers.Â Their products are sold and distributed via the company website or Amazon. An online focus rather than physical retail and multi-level marketing means less costs. This allows Plant Guru to offer low prices for their products. This is one of the best reasons to test out their essential oils for yourself. The company remains small with just 30 employees.Â As a small business, Plant Guru does not maintain its own laboratories. The oils are sourced from suppliers across the globe. With all oils purchased overseas, how do they handle quality control? By only working with suppliers that meet the USDA standards for health supplements. Plant Guru also conducts their own testing through a third-party lab. The oils are tested using Gas Chromatography (GC) and Mass Spectrometry (MS) testing. These tests help detect any contaminants. They have become the standard for establishing essential oil purity. The presence of specific substances, including any toxins or impurities, are easily identified. For science and chemistry geeks (like me) here’s a sample GC/MS report for Lemongrass. The company makes these reports readily available to confirm the purity of their oils. Plant Guru claims their oils are 100% natural with no diluting agents or additives. Oils are extracted using the cold pressing method, steam distillation, or solvent extraction. They also avoid adding any synthetic bases, carriers, or chemicals to the products. Through rigorous sourcing and testing, when you buy Plant Guru essential oils, you are assured of high-quality, natural oils. Plant Guru also carries some of the less common oils, which is great if you want to try something different. Examples are wormwood oil, blood orange oil, juniper berry, and dozens of others. The company also offers a small selection of 100% USDA certified organic oils. The organic range includes the most popular oils at a slightly higher price. You can get organic frankincense, lemongrass, lavender, eucalyptus, and more. Like the rest of their range, they are high quality and at a fair price. All the essential oils are are sold individually. Many are also bundled into variety packs or samplers. The great thing about these packs is it allows you to try a range of oils at a reduced price when compared to buying them individually. Plant Guru also offer (at the time of writing) 14 different synergy blends. One of the most popular blends is Four Gurus, a blend based on Young Living ‘Thieves’. It includes cinnamon, clove, lemon, rosemary, and eucalyptus. This is a powerful combination of antibacterial and antiviral properties that may help boost your immune system. Comparing the price of these two blends highlights Plant Guru’s commitment to high quality at a low cost. Other special blends include Love Potion, Shoo Fly, and Sleep Tight. You can also buy variety packs that include a range of blends to sample like this one. A unique and convenient offering from Plant Guru are their specialty packs. These feature a selection of oils grouped together based on their specific uses. For example, there is a Weight Loss pack, Kitchen pack and Respiratory kit. The respiratory kit includes rosemary, tea tree, eucalyptus, peppermint, lemon, and a synergy blend. The oils can be used in many ways to help open the air passageways and help respiratory function. Plant Guru sells more than just essential oils. Their website and Amazon listings include various butter, waxes, incense, and gift sets. Also available are carrier oils for making your own essential oil blends. If you don’t have a diffuser, Plant Guru has you covered there too. They sell a basic range of ultrasonic diffusers at affordable prices. Diffusers are the best way to distribute the therapeutic properties of the oils throughout a room. The diffusers, like their oils, are reasonably priced. You can find ultrasonic USB diffusers and diffuser packages that come with a selection of Plant Guru essential oils. When you start looking at the products offered by Plant Guru, the low price is one of the first features to stand out. The packages are often much less expensive compared to top-selling, well known brands. One reason for the low price is the size of the bottles. Plant Guru typically packages 10 ml bottles in multi-pack oil sets, while others often sell 15 ml bottles. Some of the samplers even come with 5 ml bottles. Plant Guru makes ‘sampling’ a range of oils very affordable, which is why their sampler packs are so popular. People generally love Plant Guru oils but there are a couple of potential concerns. This is to be expected when dealing with a new, small business trying to compete with much larger corporations. One issue is the age of the company. As a relative newcomer to the essential oil industry, Plant Guru does not have a long history or large customer base. Despite their limited experience, they offer a high-quality product at competitive prices. There have been a few complaints filed with the Better Business Bureau (BBB). Several customers have complained about not receiving their orders after making purchases online. But, most of these complaints have been resolved. The small number of complaints is also minor considering that over one million people have purchased Plant Guru essential oils. The customer service number and contact info are available on the companyâs website. If your order does not arrive, you should have no problem getting in touch with the customer service department. There are dozens of companies that sell essential oils, including many global corporations and multi-level marketing companies. Plant Guru is a small fish in a large pond offering products that match or surpass the quality of their competition. With Plant Guru you get these quality oils at fair prices. Plant Guru sells most of their oils in 10 ml bottles or 5 ml samples. This helps create a lower entry point for testing and sampling a range of oils.Â In fact, you get a 14-pack sampler of 5 ml bottles for around $20. It is a great deal and a great way to test the therapeutic value of these oils for yourself. Bottom Line: Plant Guru offers tested 100% pure oils with no additives at a fair price. If you want high quality essential oils at low prices, Plant Guru is an ideal choice. We recommend starting with one of the sample packs. This gives you a way to experience a variety of oils which at a very affordable price. You should definitely give them a try.